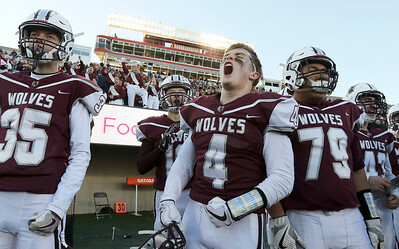 H. Rick Bamman - hbamman@shawmedia.com Prairie Ridge players Brandon Minutillo (from left) Jackson Willis, Khan Dang and Patrick Coyle react in the closing seconds of the fourth quarter during the Class 6A state final game against Nazareth Academy on Saturday Nov. 25, 2017 at Northern Illinois University's Huskie Stadium. 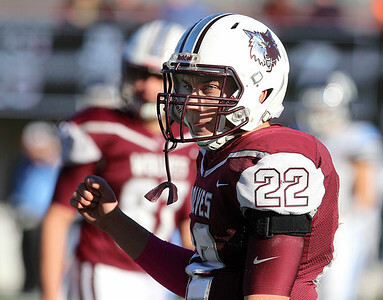 Prairie Ridge won 28-21. 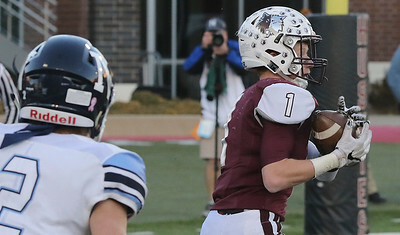 H. Rick Bamman - hbamman@shawmedia.com Prairie Ridge receiver Carter Evans runs a route against Nazareth Academy defensive back Devon Wall during the Class 6A state final game against Nazareth Academy on Saturday Nov. 25, 2017 at Northern Illinois University's Huskie Stadium. Prairie Ridge won 28-21. 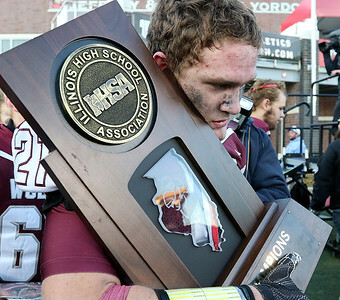 H. Rick Bamman - hbamman@shawmedia.com Prairie Ridge players Justin Mikolajczewski (from left) Joe Perhats, Jeffery Jenkins and Samson Evans hoist the Class 6A championship trophy after their 28-21 win over Nazareth Academy on Saturday Nov. 25, 2017 at Northern Illinois University's Huskie Stadium. H. Rick Bamman - hbamman@shawmedia.com Prairie Ridge's Samson Evans returns a punt for 78 yards and a touchdown in the second quarter during the Class 6A state final game against Nazareth Academy on Saturday Nov. 25, 2017 at Northern Illinois University's Huskie Stadium. 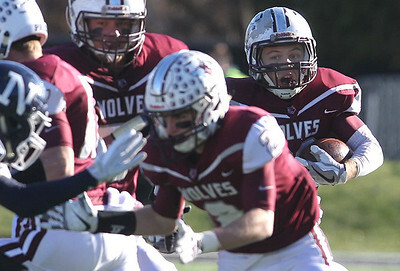 H. Rick Bamman - hbamman@shawmedia.com Prairie Ridge's Samson Evans runs behind the blocking of Jeffrey Jenkins the Class 6A state final game against Nazareth Academy on Saturday Nov. 25, 2017 at Northern Illinois University's Huskie Stadium. H. Rick Bamman - hbamman@shawmedia.com Prairie Ridge offensive lineman Jeffrey Jenkins (77) and quarterback Sampson Evans celebrate Evans' fourth quarter touchdown in the Class 6A state final game against Nazareth Academy on Saturday Nov. 25, 2017 at Northern Illinois University's Huskie Stadium. Prairie Ridge won 28-21. H. Rick Bamman - hbamman@shawmedia.com Prairie Ridge's Samson Evans turns in the endzone after 78 yard punt return against Nazareth Academy during the Class 6A state final game on Saturday Nov. 25, 2017 at Northern Illinois University's Huskie Stadium. 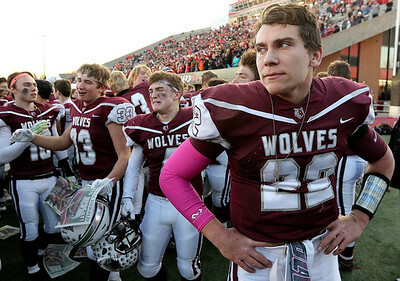 H. Rick Bamman - hbamman@shawmedia.com Prairie Ridge quarterback Samson Evans looks to the sideline for the call in the first half during the Class 6A state final game against Nazareth Academy on Saturday Nov. 25, 2017 at Northern Illinois University's Huskie Stadium. H. Rick Bamman - hbamman@shawmedia.com Prairie Ridge quarterback Samsnon Evans (right) and teammates let the 28-21 win over Nazareth Academy sink in on Saturday Nov. 25, 2017 at Northern Illinois University's Huskie Stadium. 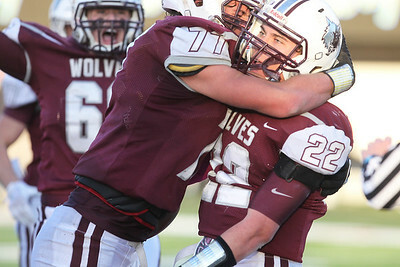 Prairie Ridge won 28-21. 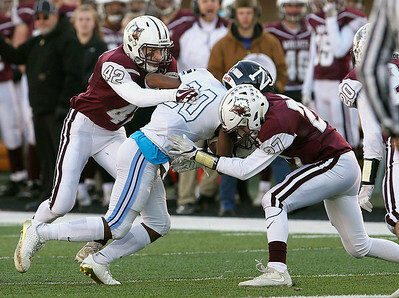 H. Rick Bamman - hbamman@shawmedia.com Prairie Ridge linebacker Drew Fryer (42) and defensive back Michael Pilafas (27) swarm Nazareth Academy wide receiver Michael Love late in the fourth quarter during the Class 6A state final game against on Saturday Nov. 25, 2017 at Northern Illinois University's Huskie Stadium. 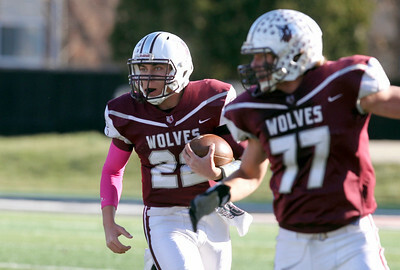 Prairie Ridge won 28-21. 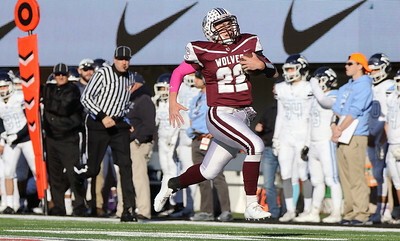 H. Rick Bamman - hbamman@shawmedia.com Prairie Ridge's Zach Gulbransen runs around blocking in the first half during the Class 6A state final game against Nazareth Academy on Saturday Nov. 25, 2017 at Northern Illinois University's Huskie Stadium. H. Rick Bamman - hbamman@shawmedia.com Prairie Ridge Jeffre Jenkins celebrates with fans after Wolve's the 28-21 win over Nazareth Academy at the Class 6A state final game against Nazareth Academy on Saturday Nov. 25, 2017 at Northern Illinois University's Huskie Stadium. 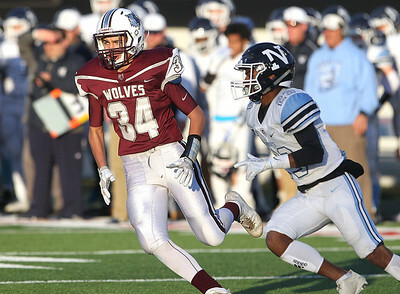 H. Rick Bamman - hbamman@shawmedia.com Prairie Ridge defensive back Drew Norton makes an interception late in the fourth quarter during the Class 6A state final game against Nazareth Academy on Saturday Nov. 25, 2017 at Northern Illinois University's Huskie Stadium. 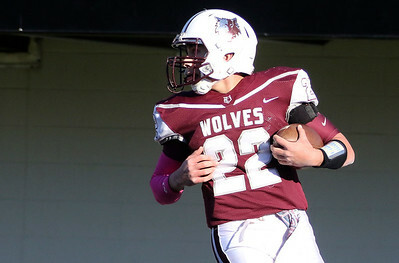 Prairie Ridge won 28-21. 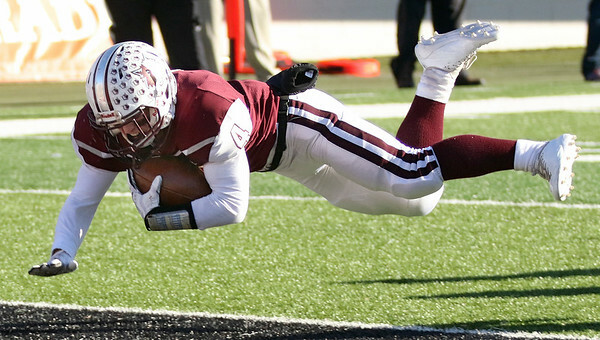 H. Rick Bamman - hbamman@shawmedia.com Prairie Ridge running back Jackson Willis sails into the endzone for a touchdown in the first quarter during the Class 6A state final game against Nazareth Academy on Saturday Nov. 25, 2017 at Northern Illinois University's Huskie Stadium. 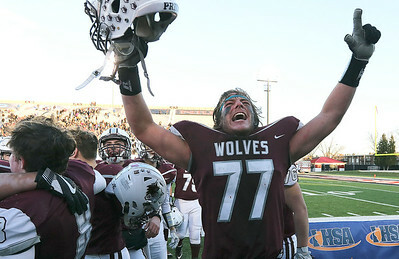 H. Rick Bamman - hbamman@shawmedia.com Prairie Ridge linebacker Joe Perhats clutches the championship trophy after the Wolves defeated Nazareth Academy, 28-21 in the Class 6A state final on Saturday Nov. 25, 2017 at Northern Illinois University's Huskie Stadium. 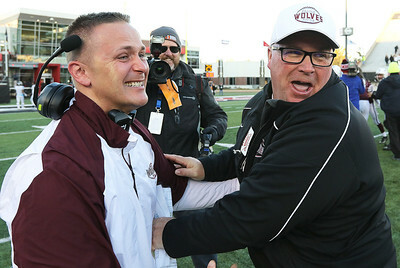 H. Rick Bamman - hbamman@shawmedia.com Prairie Ridge defensive coordinator Andy Peterson and head coach Chris Schremp react after the Wolves 28-21, win in the Class 6A state final game against Nazareth Academy on Saturday Nov. 25, 2017 at Northern Illinois University's Huskie Stadium. 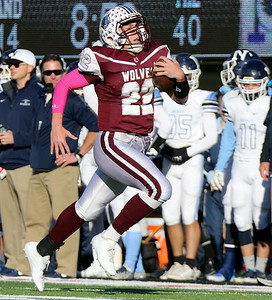 Prairie Ridge's Samson Evans turns in the endzone after 78 yard punt return against Nazareth Academy during the Class 6A state final game on Saturday Nov. 25, 2017 at Northern Illinois University's Huskie Stadium.